We had a bluebird day here in AP. My group went off to visit a West Coast attraction leaving me free to climb for the day, so I took the opportunity to do a little climb to the top of Mt Temple 1913m. 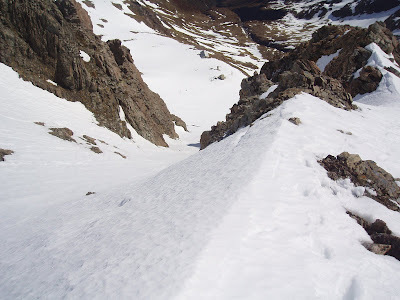 I walked up the track to Temple basin ski field, then skinned up to Temple col, where I changed to crampons, and headed up the ridge to the summit. 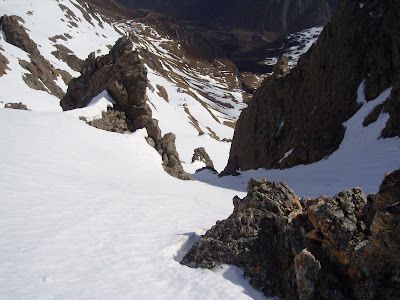 The guide book says that you need to siddle west towards the skifield, but the snow was supportive over the Mingha side so I did that instead. The route required some interspursed rock and snow climbing, but generally flowed well at an easily manageble grade. Towards the top in the shade was very hard ice, so crampons only just bit in, but the exposure was only momentary. 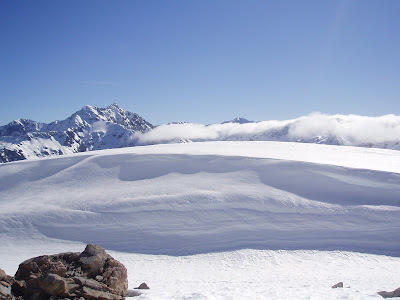 It was beautiful on the summit, with a straight forward descent.From the summit I skied out of the two obvious coliours; firstly, coming directly off the summit next to the large buttress, and then secondly, siddling left, down a wide chute running directly to the downhill lift shed. I had lunch there and then headed back up towards the summit of B'limit, but bailed near the summit, due to cloud cover coming in from the west. The snow is disappearing at an alarming rate, as it always does in the warn NW rains that we have had earlier this week. I hope I get a chance to do the Phipps - Temple Travers, while it is still supportive! Above are the usual photos of the day. Enjoy! I certainly did!